Stained glass window image of a dove descending above a baptismal font. 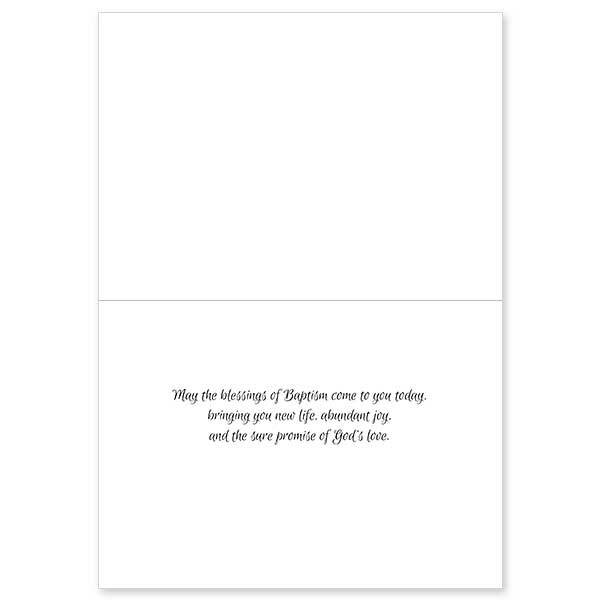 The cover message is in white on a silver foil background. A beautiful stained glass piece of a guardian angel watching over a sleeping girl. 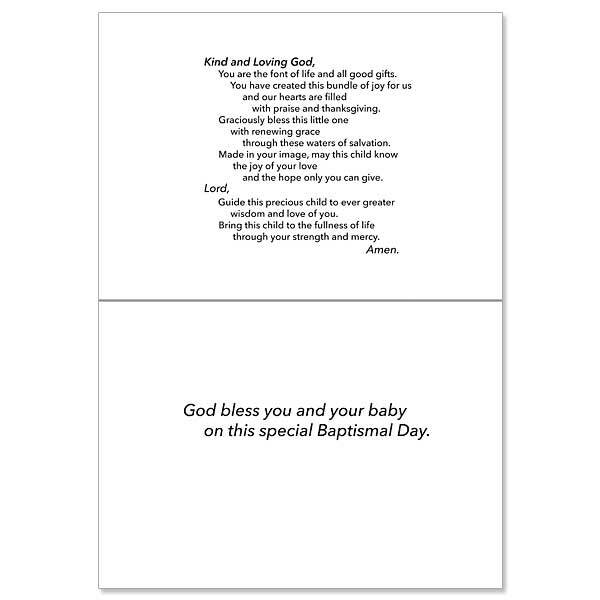 A perfect gift for a new baby or baptism. 6 1/2". Metal chain included for hanging. Stand included. Candle, dove, chi rho and water basin. 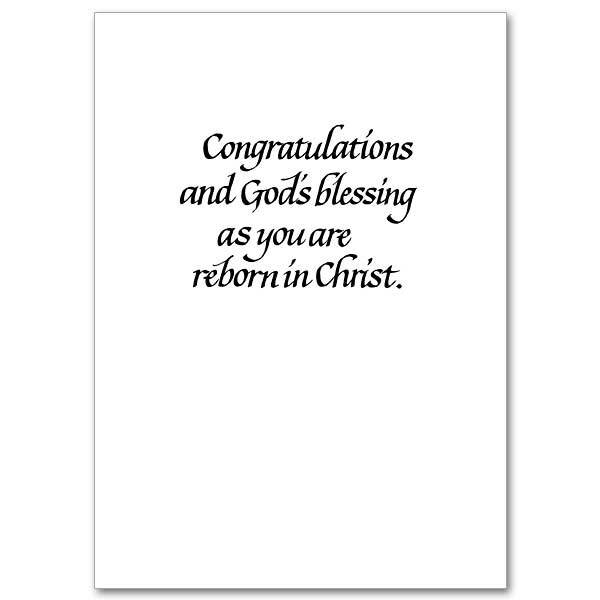 Rejoice with those becoming children of God in the sacrament of Baptism. 5" by 7" with envelopes. 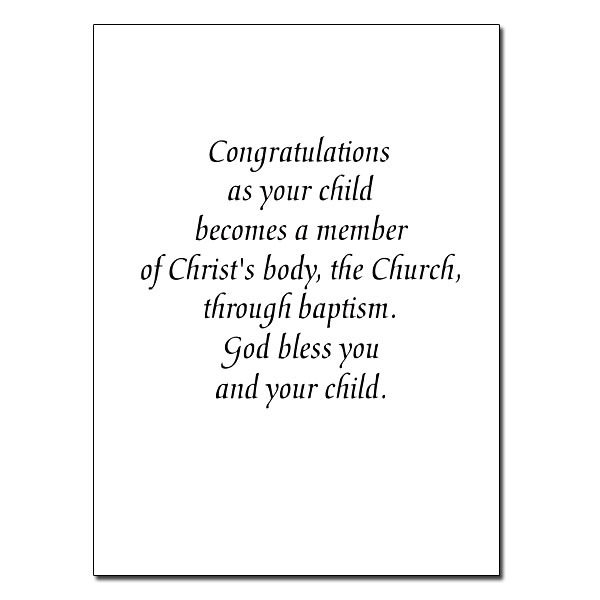 Rejoice with those becoming children of God in the sacrament of Baptism. 5" by 7". Printed on recycled paper. 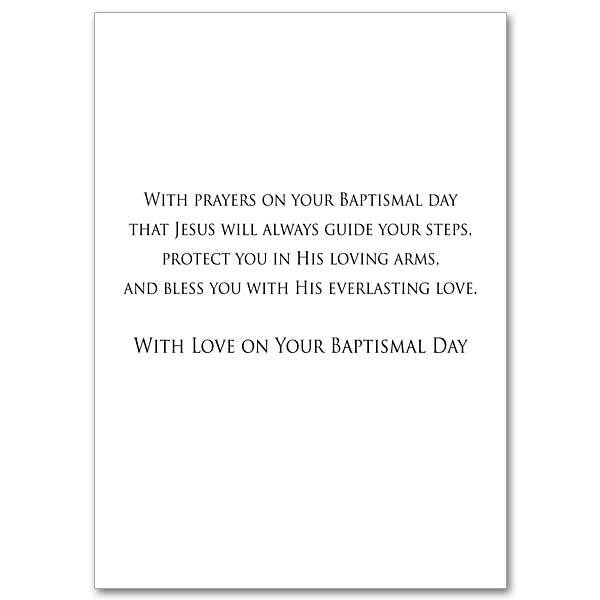 Rejoice with those celebrating their child&apos;s joining with the community of faith in the sacrament of Baptism. The cards measure 5.93" by 4.38". …Glory Be spoken in a real child&apos;s voice. A perfectly prayerful accompaniment to any bedtime snuggle routine. 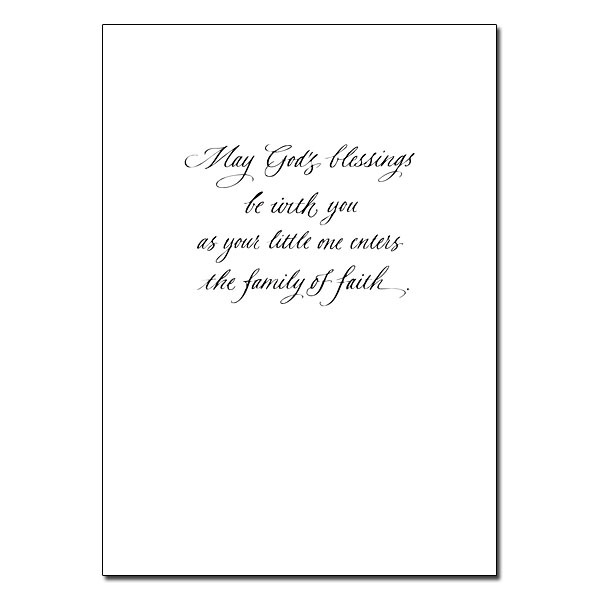 Embroidered cross and inspirational patterns make this the perfect baptism or baby shower gift. Baby-safe sound box with replaceable batteries and on/off power switch. 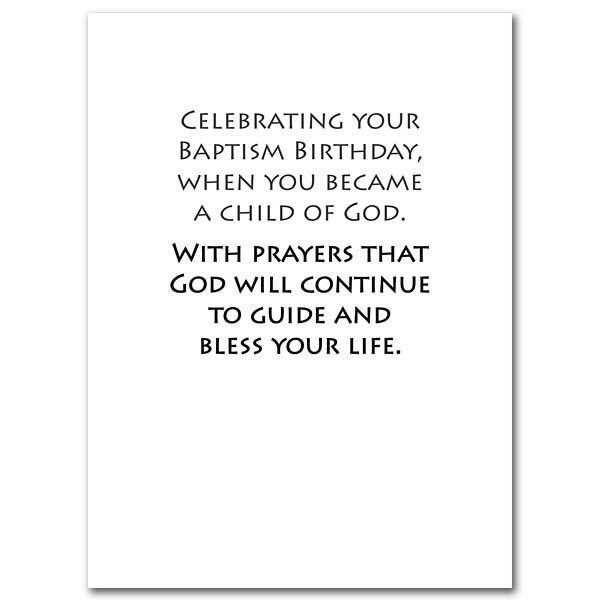 Ages: 0+ 9"
Rejoice with those becoming children of God in the sacrament of Baptism. 5" by 7"
…6mm glass and pearl beads along with silver cross make this bracelet the perfect gift for that special little girl. 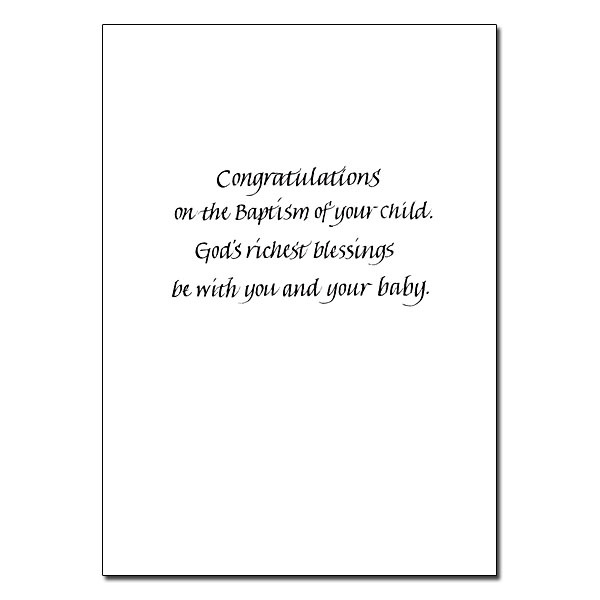 It can be worn for baby&apos;s baptism and the young girl&apos;s First Communion or Confirmation. Then on the young lady&apos;s Wedding Day, it can be woven into her bridal bouquet. An Easter candle is the central focus of this image with a background of brilliant light emanating from the candle in shades of yellow, orange and magenta. Swirls of flowing water are seen below in shades of teal, blue and purple. Contemporary illustration of the Holy Spirit with droplets of water the left panel with a monochromatic drawing of a priest pouring water of the forehead of a baby at the center of the card on a blue background. Baptism stained glass image with descending dove.